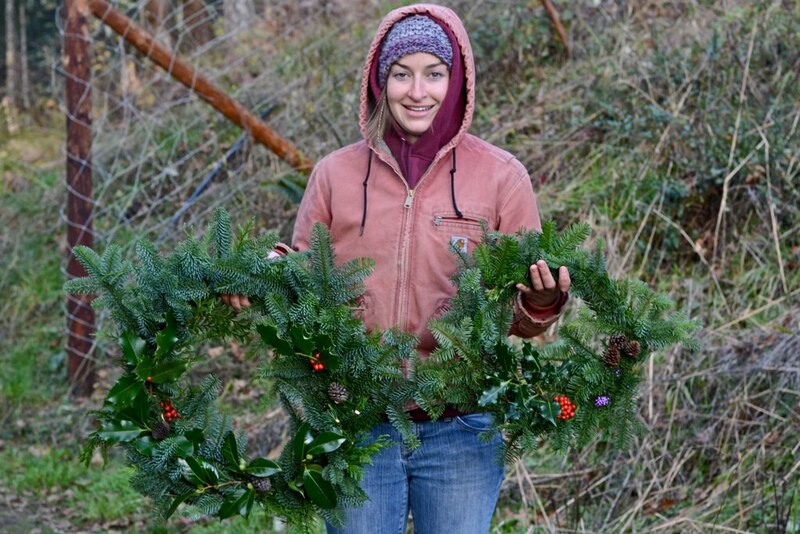 I’m not much of a crafter, I hate decorating, and I don’t get too worked up about Christmas, BUT I hosted my third annual wreath-making party at my house today. 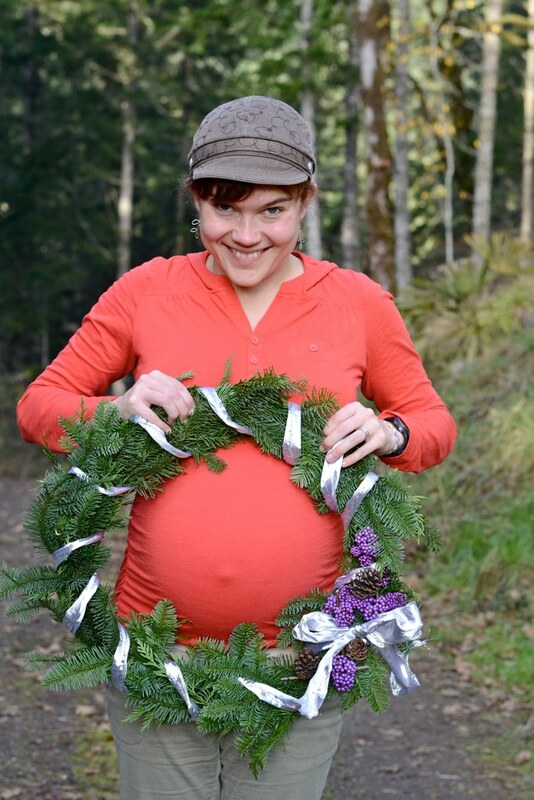 Two years ago, I had never made a wreath in my life, but I decided that I wanted to get my girlfriends together for an occasion, and I think greenery is one of the best parts of the holiday season, so I combined the two into a party. 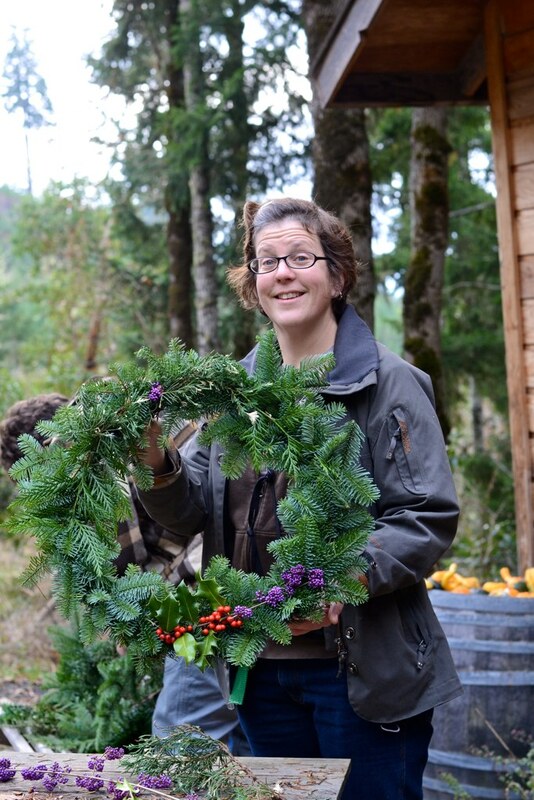 Fortunately, I had several friends with wreath-making experience, so they schooled the rest of us on the craft. 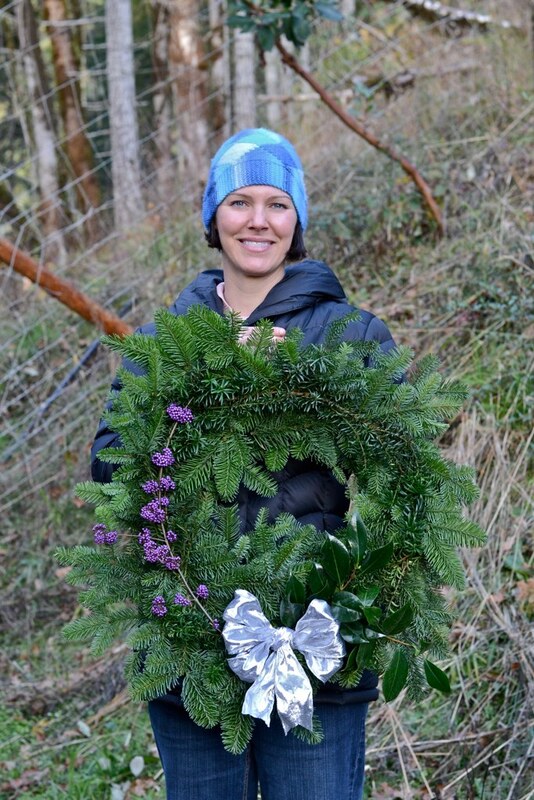 It was surprisingly easy, and I was amazed that my first-ever wreath looked pretty darn good. 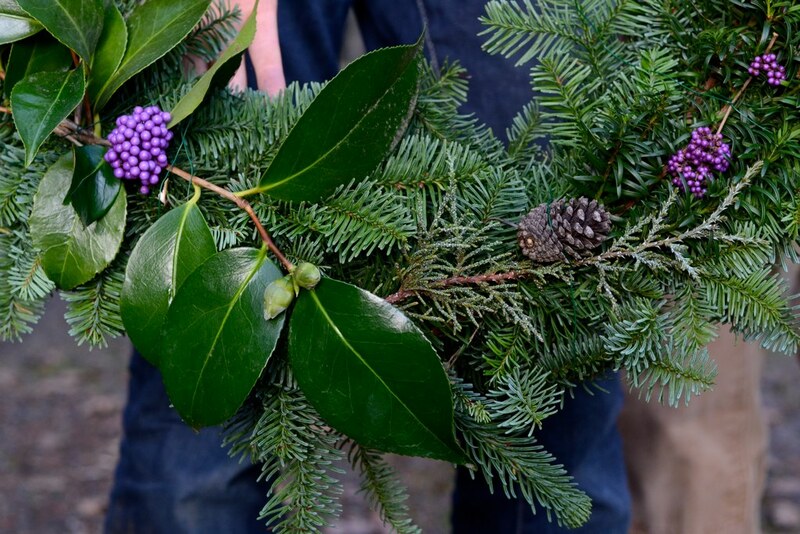 Earlier this week, my dad and I went out and had some quality time in the woods together, cutting boughs for the party. 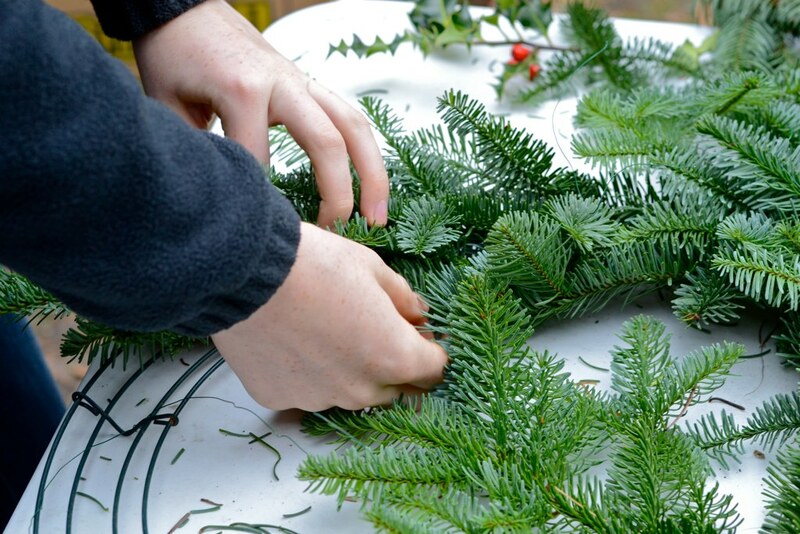 He works for a local timber company and used to cut a lot of greens for professional and amateur wreath makers. He knows what he’s doing (unlike me)and has several locations that he goes back to year after year for nice noble fir and western red cedar. In an afternoon, we harvested about half a pickup load of sprigs and branchlets. I invited about twenty people, thoroughly aware that this time of year is busy for many people (myself included). About 12 friends showed up, which was a small enough crowd that I got to have a little one on one time with everyone in attendance. I don’t know about anyone else, but when I’m in the middle of a group of people that I don’t know well or at all, I’m a lot more comfortable if I have something to DO. 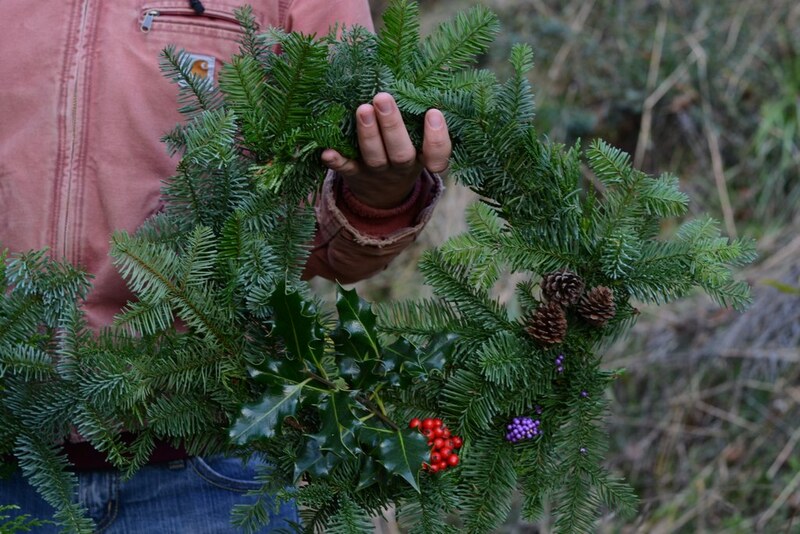 Wreath making provided the perfect amount of distraction/conversation starter, so everyone was able to engage with strangers as much or as little as they wanted. It was fun to see folks from such different times/parts of my past standing side by side chatting away with each other. 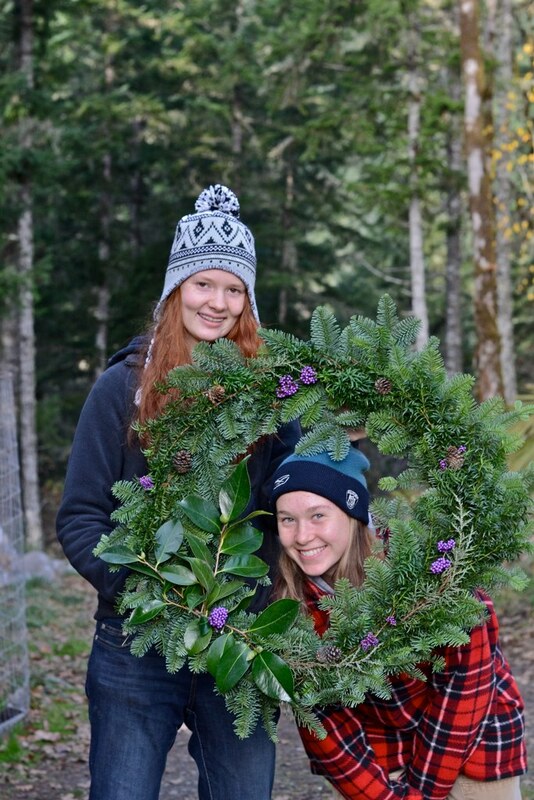 Left: Those are my amazing neighbor girls, Wren and Anna Rose who worked together on that lovely wreath. 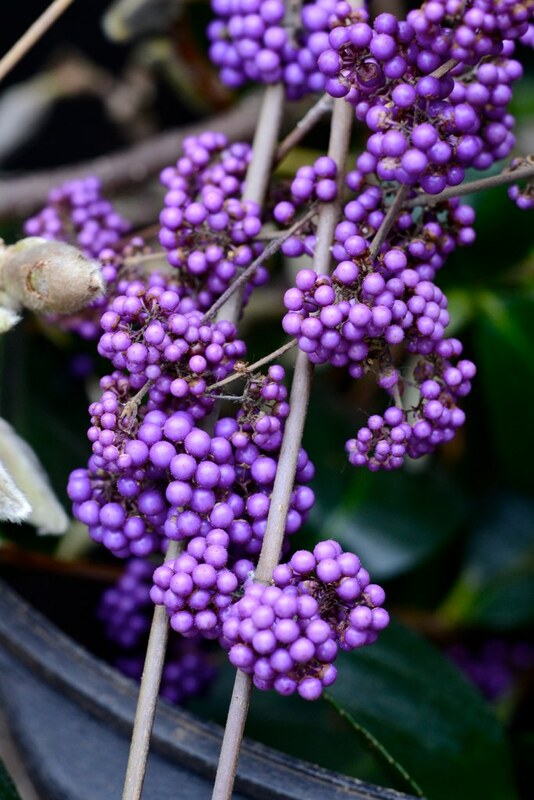 My friends Nate and Cal came down from Portland and brought a bunch of beauty berry trimmings. 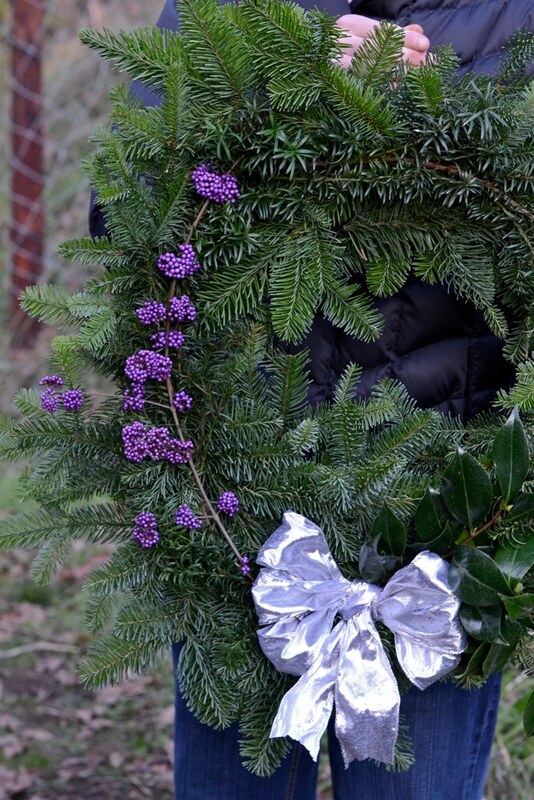 They were a little non-traditional for wreaths, but everyone loved them, and they looked great. 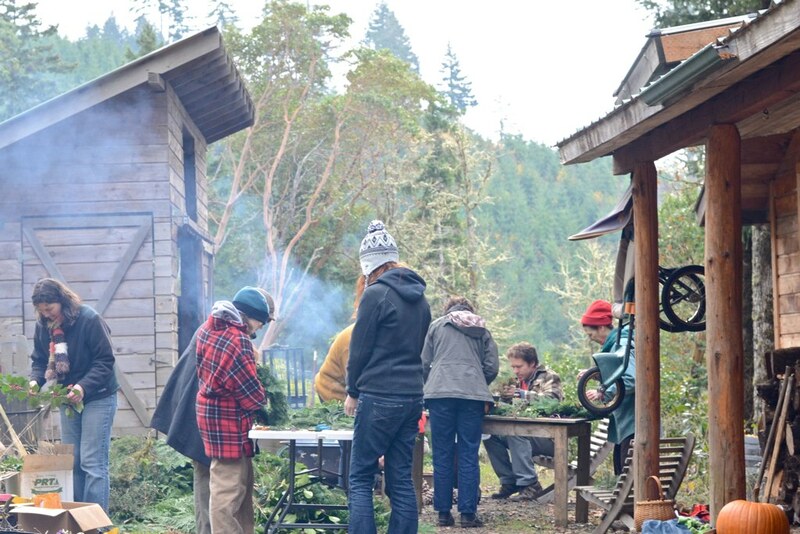 I set up wreath making stations in the driveway between the goat barn (left) and the cabin (right). 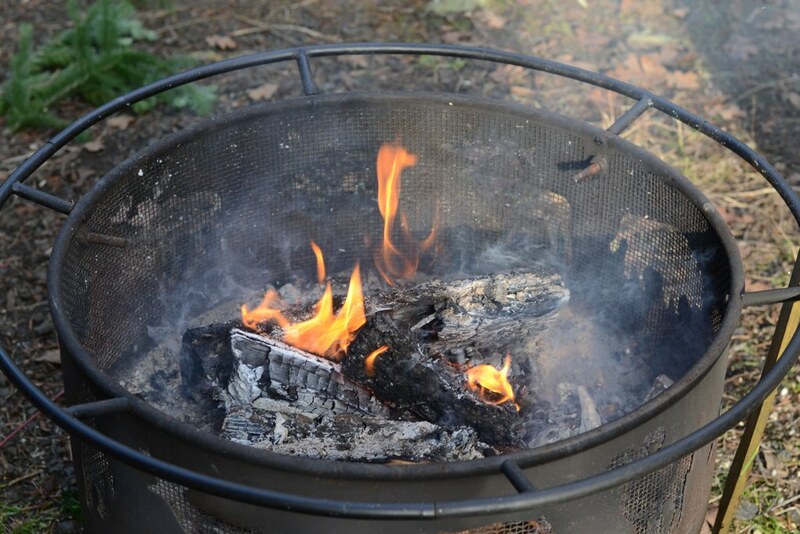 We had a nice fire pit to stand around and warm up hands. We also consumed a lot of tea and coffee. Plus the house was toasty warm, and we all rotated in and out as needed. Left: Cara was one of my roommates in college. Right: Cal is a friend who lives in Portland. 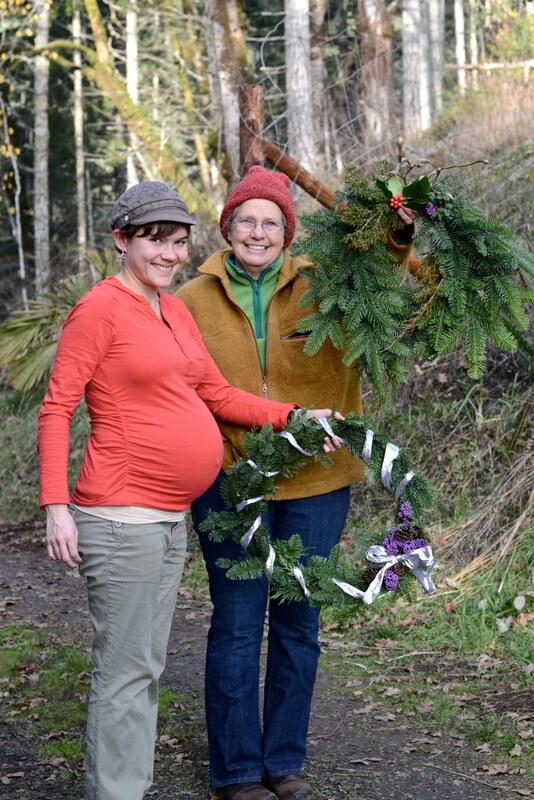 Left: My sister in law Shannon and friend Carol (who I wrote about in this post) show off their creations. Right: Shannon is about eight months pregnant with my very first niece or nephew. Isn’t she cute? Dayna is a friend from high school. Life is so crazy busy right now that in some ways it seemed kind of imprudent to block out an afternoon for bough cutting, a morning for housecleaning, and another afternoon for doing nothing more that hanging out with my friends, but it was so worth it. Even though most of these folks live in my community, I never seem to spend as much time with them as I’d like to, and having them all out to my house even for just a few hours seemed pretty special. It was also nice to do something that was completely non-commercial for the holidays. We all had a great time. Wow! I’m so jealous – these look incredible and the afternoon with the fire pit just sounds amazing. Thanks for sharing! What a great idea! My friends and I would love this and know what you mean about keeping busy in a social setting. It’s why I like to host. 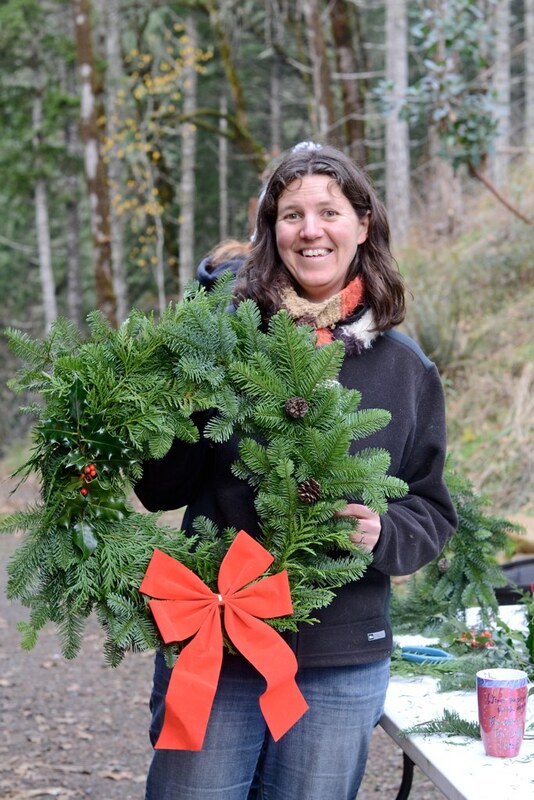 Maybe next year I’ll host a public Wayward Spark-sponsored wreath party, and y’all can fly cross country to make your own wreaths. Jenny! I’d love to give you a private lesson. I have some oranges for you, too. I’ve been meaning to call, but things are pretty crazy busy around here, and well…it hasn’t happened. Let’s celebrate that little girl’s birthday sometime, yeah?